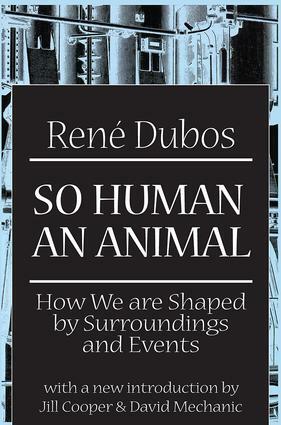 At least until cloning becomes the order of the day, Rene Dubos contends that each human being is unique, unprecedented, unrepeatable. However, today each person faces the critical danger of losing this very humanness to his mechanized surroundings. Most people spend their days in a confusion of concrete and steel, trapped ""in the midst of noise, dirt, ugliness and absurdity."" So begins the essential message of the work of one of the great figures in microbiology and experimental pathology of this century.Is the human species becoming dehumanized by the condition of his environment? So Human an Animal is an attempt to address this broad concern, and explain why so little is being done to address this issue. The book sounds both an urgent warning, and offers important policy insights into how this trend towards dehumanization can be halted and finally reversed. Dubos asserts that we are as much the product of our total environment as of our genetic endowment. In fact, the environment we live in can greatly enhance, or severely Hmit, the development of human potential. Yet we are deplorably ignorant of the effects of our surroundings on human life. We create conditions which can only thwart human nature.So Human an Animal is a book with hope no less than alarm. As Joseph Wood Krutch noted at the time, Dubos shows convincingly ""why science is indispensable, not omnipotent."" Science'can change our suicidal course by learning to deal analytically with the living experience of human beings, by supplementing the knowledge of things and of the body machine with a science of human life. Only then can we give larger scope to human freedom by providing a rational basis for option and action. Timely, eloquent, and guided by a deep humanistic spirit, this new edition is graced by a succinct and careful outline of the life and work of the author.